They’re being banned from museums, art galleries, and sporting events faster than people can buy them, but that’s ok because selfie sticks are awful and deserve to disappear. 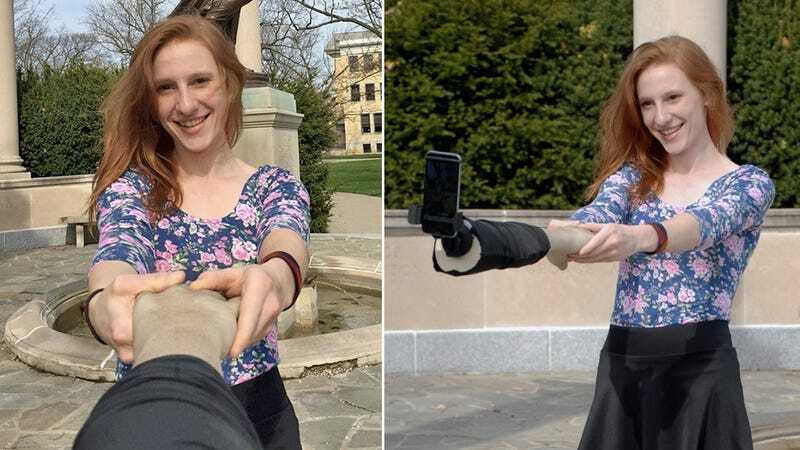 However, designers Justin Crowe and Aric Snee may have found a way to redeem them with a selfie stick that looks like a human arm so a self-shot can help hide someone’s crushing loneliness. The Selfie Arm is still a concept at this point, and hopefully if the pair ever decide to commercialize their creation they’ll make it look less dead and gray. But the idea might help to make the selfie stick fad seem slightly less awful because the resulting photos don’t actually look like you’re taking a picture of yourself. Instead, they appear as if a lover or a good friend is actually behind the camera opposite you.